Our Classic Dungeon Design Leather Paddle just got a little scary with the addition of Super Sharp Spikes! 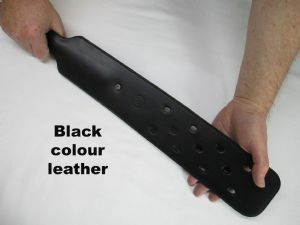 This medium sized Dungeon paddle is of our own unique design, made from high grade A Classic Grained English Bridle leather in Black with a classic smooth black leather plain reverse, with Nine super sharp central stainless steel spikes on one side, and a full flat smooth surface on the rear making this a very versatile paddle. Spikes are screwed and bonded firmly fixed inside of the two layers of leather. Each paddle is hand cut, bonded, reinforced metal handle, then stitched with heavy duty strong breaking thread. The paddle is then bevelled and burnished edged, holed and a leather hanging cord added for storage. This is a great textured but scary looking paddle to use in Fear and Anticipation type Play, after all it's all in the intention of the user! This Spiked Dungeon Paddle isn't for the faint hearted! Purchase is for a single Custom Made Black English Bridle Leather Dungeon design 9 spiked paddle. We do not accept returns on Custom Made, Bespoke, Impact, clearance/sale and Personal Items like insertables etc due to hygiene issues.